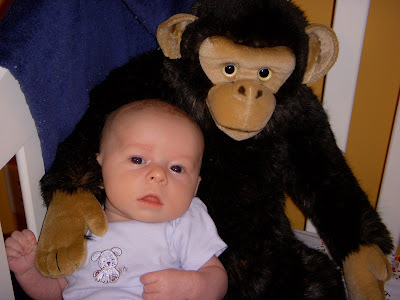 When I was born, my Tam-maw and Papa Jim gave me a big monkey. I kept meaning to ask Mommy to take a picture of him, before I got too big. Yesterday, while cleaning my room, she remembered. He is a giant sized Gund Chipanzee. He has special eyes that follow you around the room. He is furry, and very soft. The BBQ for yesterday got postponed because Tam-maw had a fever, so her and Mommy agreed that she would wait to see me again until she felt better and was fever free. Mommy doesn't want anyone around me that might make me sick. She is very protective. Daddy is at Sunday School right now, but should be home soon. Mommy got up with me at 5am because she had a migraine, and needed to take something for that. So, Daddy finally got to sleep a little later. I was a good boy and went to sleep at 10:30 last night, but Mommy and Daddy stayed up later because Mommy was having a hard time getting to sleep. Daddy read us a couple of really good stories last night. It is from a book called Tales of the Kingdom. They are some of Mommy's favorite books. She has the first two in the series, and will have to buy the 3rd one to read to me too. Daddy really enjoys reading to me and Mommy. My Babycubes came yesterday, and my special spoon! Mommy is excited because they are exactly what she wanted. Today is a NASCAR day, so I will watch the race with Daddy. Guess that is all I know for now! Bye Bye! This entry was posted on Sunday, June 01, 2008 . You can leave a response and follow any responses to this entry through the Subscribe to: Post Comments (Atom) .